Also Recommended: Love Hina is better, in my opinion. Notes: Based on the light novel series by Hajime Kamoshita and illustrated by Keiji Mizoguchi. It was also adapted into a manga series, which as of March 2015 is still ongoing (notes by Nicoletta Christina). 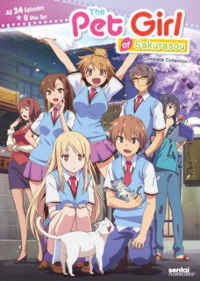 Sorata Kanda is attending Suimei High School, a school for budding artists, but due to a propensity to keep cats he is banished from the regular dorms and assigned to the Sakurasou Dorm, where the school relegates its misfits. But the Sakurasou residents’ time and energy seems less involved with their classwork than in various extracurricular projects- and in romantic relationships with each other. Shortly after he arrives he is introduced to the character condescendingly referred to in the title, whose actual name is Mashiro Shiina. Mashiro seems a bit implausible; she’s an award-winning painter who’s decided she’d rather do manga instead. Oh, and she apparently has some form of autism, though it’s never actually called that- she speaks in a monotone, has a lot of trouble understanding emotion (at first; this doesn’t last), and is apparently unable to handle simple tasks like dressing herself, so Sorata helps her with these things (you can just imagine the opportunities for fanservice and “misunderstandings” that this plotline creates, and of course the show fully exploits them.) Mashiro’s hardly an original character, though; in a less “realistic” anime, she’d be a robot or an alien or some other kind of individual without any social skills. In fairness, there were things about her that apparently were given some thought; for example, she draws on her dormmates’ experiences for her manga plots, and that’s exactly what you’d expect someone to do who’s an accomplished artist but has trouble understanding emotion. (There was a genuinely poignant moment when two lovers she’s been using for her plots have a falling out, and Mashiro asks the female half of that newly-sundered pair to tell her how the story is going to come out.) On the other hand, Mashiro does rather quickly discover jealousy. The object of the jealousy is Nanami Aoyama, one of those “childhood friends” of our male hero who can’t stand the idea of him doing any “hanky panky” with the likes of Mashiro and so, of course, moves into Sakurasou herself. She’s an aspiring voice actress. (Did I mention that for some reason almost everybody in this cast wants to create stuff for otakus?) Naturally, Nanami is also secretly in love with Sorata. I hesitate to call this a harem show, but only because a proper harem show, in my opinion, requires at least 3 females in pursuit of the male lead, and we’ve only 2 here. The show has another male character who I wish had been the lead rather than Sorata. He’s Jin Mitaka, and he’s kind of the Kyon type (of Haruhi fame)- quiet, cynical, clever . Jin was apparently also a bit of a ladies’ man, whose conquests had apparently even included the older sister of Misaki Kamiigusa, though he finally decided he loved Misaki herself, the younger sister (and his partner in anime production); he’s been quietly shedding all his other ladies in Misaki's favor. Misaki pretty much has the opposite personality to Jin’s; in fact, she reminds one of Love Hina’s Koalla Su, including, among other things, a tendency to jump on people (though the impact of that is quite a bit different when, rather than a kid, the jumper is a rather large-breasted high school senior.) Despite his cleverness, and his own professed feelings for her, Jin completely fails to comprehend Misaki’s feelings at a critical point, and so for a time we are faced with Mopey Misaki, who is rather harder to take than even Manic Misaki had been. One curiosity of the streamed version of the show that I saw is that the English credits don’t even list the VA for Misaki, though they do list some more minor characters. One of those characters who IS listed is Ryunosuke, a recluse who says he hates girls, though he LOOKS like one. (In fact, he rather resembles Oreimo’s Kuroneko, right down to the sarcastic tendencies.) He too is being chased by a female, though in his case by a foreign national. Everything that happens in this show flows from the above. It’s mainly driven by the rivalry between Mashiro and Nanami for Sorata’s attention; by some of our cast feeling awed by Mashiro’s art and a bit jealous of her talents; by everyone’s attempts to break into commercial arts (if, again, otaku-friendly ones like anime, manga, and games); by the inevitable culture-festival project (a rather embarrassing CG anime called Nyapollon); and by that mainstay of school comedies, a threat to their home. It’s overlong for the story it tells, and fans of the genre can probably guess which plot threads are, and which are not, resolved at the end. (The plot thread I really cared about came out well, so I’ll give it some credit for that.) The character animation is only middling, and the songs only so-so (though the second ending song, “Prime Number”, I kind of liked.) And I really didn’t like Sorata that much, nor do I care more for the show's patronizing title. Recommended Audience: Yes, there’s fanservice, but mainly at the beginning; the main offenders are Misaki and Mashiro. (Nanami’s too proper for that.) Older teens and up.